Ideally situated opposite Trinity College and just minutes away from Dublin’s major tourists attractions and business districts, The Earl of Kildare hotel is the perfect location for business, a shopping trip or pleasure. Right in the heart of Dublin’s City Centre the hotel is an excellent example of the beautiful Georgian architecture of which Dublin is famous. If the guest would like to relax amidst complete beauty and peace the parks on Merrion Square and St Stephens Green are close at hand. And for the ceol caint agus craic Peig’s night club is second to none. Temple Bar is just across the way with a sizzling night life and a vibrant cosmopolitan atmosphere. A warm cead mile failte will greet you as you walk through the doors of The Earl of Kildare Hotel. Each of the bright, warmly decorated rooms come complete with colour televisions, direct dial telephones, tea & coffee making facilities and hair dryers. Parties and groups are very welcome, and a range of conference and meeting rooms are also available. Overlooking Trinity College, the hotel's bar serves a first-rate carvery lunch, and food and drink is available throughout the day. The bar is a Victorian style bar and it is decked out with pictures of famous Irish politicians, and the hotel is just around the corner from Dail Eireann. The food is served in very comfortable surroundings and at very affordable prices. The hotel is home to the renowned Peig's nite club, very popular with both visitors and Dubliners alike. Comfortable and stylish it is ideal for dancing the night away. An added bonus is the Sunday night Latin music night with lessons catering for all levels of ability. Situated in the heart of Georgian Dublin the guest can combine the famous old Dublin of Joyce and O Casey with the modern vibrant cosmopolitan Dublin. 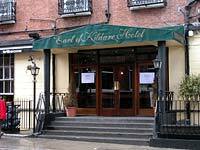 The Earl of Kildare Hotel is just a step from Grafton Street, Ireland’s best known and loved pedestrian shopping street. Saunter around; shop until you drop and no annoying traffic to disturb you. Trinity College is just a step away and there you can explore the Book of Kells, the Book of Durrow and other ancient manuscripts and the Old Library. Dublin’s famous tourist’s attractions The National Gallery, the Natural History Museum, Government Buildings, The Gaiety and Olympia Theatres, fashionable Temple Bar, and O'Connell Street, are all just a short wander from the hotel. Also Dublin’s business districts are close by so The Earl of Kildare is a perfect location for all occasions.